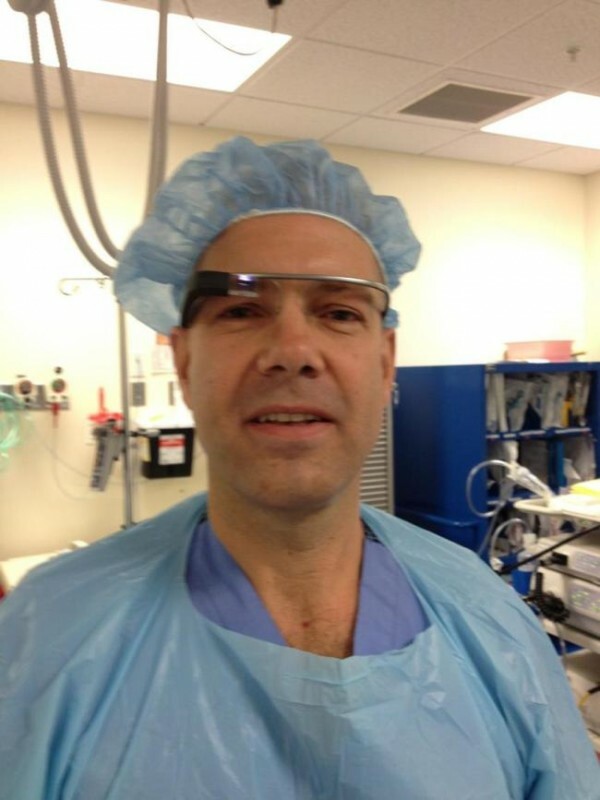 Dr. Rafael J. Grossmann, a trauma surgeon at Eastern Maine Medical Center in Bangor, is testing Google Glass, a wearable computer with an optical head-mounted display. A Bangor surgeon has made high-tech history by bringing the latest innovation from Google into the operating room. Dr. Rafael Grossmann, a surgeon at Eastern Maine Medical Center, used Google Glass, the tech giant’s new wearable computer, to record a surgery he performed on a patient last Thursday. Grossmann was one of 8,000 developers and consumers chosen by Google earlier this year as “explorers” to test the device before its release to the general public. He applied on his own to become a Google Glass Explorer in consultation with EMMC’s administration, according to a hospital official. Grossmann wrote about the surgery — which appears to be the first time Glass has assisted during a live procedure — on his personal blog. The device connects wirelessly to the Internet and responds to spoken commands. Grossmann arranged to stream the video to demonstrate the device’s capabilities, but the footage was accessible only through his own dedicated Google account and no identifying information about the patient, including the patient’s face, was transmitted or recorded. He emphasized the importance of patient privacy in using Google Glass for surgery, pointing out that the patient consented to the Google-assisted procedure in advance. Grossmann, a general and trauma surgeon, said he sees great potential for Google Glass in medicine, from allowing doctors to mentor medical students remotely to consulting with each other without being tied to a computer or telephone. “By performing and documenting this event, I wanted to show that this device and its platform are certainly intuitive tools that have a great potential in health care,” he wrote on his blog. No major complications occurred during the surgery, and Grossmann hopes his first “homemade” attempt will lead to wider adoption of Glass in surgery. With Glass, doctors could instantly look up a concept or medical scan, perform an operation and connect live with group of students or surgeons anywhere, link to another physician for advice when an unexpected complication arises or speak to a sick child’s parent remotely anytime, anywhere, Grossmann wrote in another post on his blog. The widely hyped wearable technology also includes a touchpad, microphone and other features built into spectacle frames that perch in front of a user’s field of vision. It’s designed to record film, take pictures, search the Internet and translate language without obstructing the user’s vision. A team of Spanish doctors also used Google Glass in surgery last week, but Grossmann said he had a 24-hour jump on his European counterparts. Dr. James Raczek, chief medical officer at EMMC, said the hospital applauds Grossmann for his innovative work with Google Glass. At the same time, EMMC is weighing the potential risks surrounding patient privacy, he said. Google Glass lacks the type of security applied to patients’ electronic health records, and further measures will be needed to protect patient information as doctors take advantage of accessing real-time information at the bedside, Raczek said. “We think that this technology may have real benefits for patients but we have to find an answer to the privacy concerns,” he said.